Monthly Bushiroad is Summer Fanservice and Oracle Think Tank gets some new cards intended to follow through on Bushiroad’s promise of a stronger Oracle Deck in G-BT12. Monthly Bushiroad August Issue, it’s centered around “Debut of the Divas” and “Prismatic Divas”. You can get a Tanabata themed background for your Smartphone. As can be seen, it has special features on the new “Chouchou” idol group for Bermuda Triangle. As well as info on the summer swimsuit SP cards in Prismatic Divas. There’s also a feature on the Vanguard G NEXT cast’s summer swimsuits, and Mini-Van this month focuses on the Bermuda Triangle cast having summer fun. In short, this is a fanservice based issue. An overview of Jaime Flowers, Fukuhara High School and Striders’ motivations, roughly. Kumi-chan is cited as giving her all going forward. Will Team Striders run into “that person” once more. And will Fukuhara be able to do anything against Team Diffriders, who are being called “The strongest foes”. Onimaru Kazumi (Shiranui) is cited as wanting to break the link of destiny between Earth and Cray and prevent human imagination from influencing Cray any further by winning the U20. Verno (Amaruda) is in love with Earth and humanity’s potential, and might meet a certain Diffrider’s “Soul”..
Noa (Chaos Breaker) is after a certain goal, but what is it? The Final Stage is set, with Kazuma and Kazumi having a score to settle, while Chrono seeks to prove his own form of playing Vanguard that he believes in. 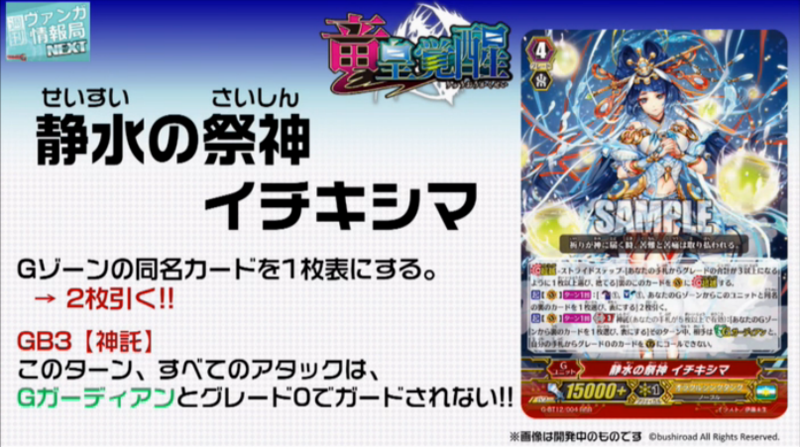 AUTO (RC) Oracle: [Retire this Unit] At the end of a battle in which this Unit Boosts, you can pay the cost. if you pay it, draw 1 card. AUTO GB1: When this Unit appears on (RC), choose 1 of your other Rear-guards with the Oracle ability in the same column, during that turn, it gains “CONT (RC): This card gains Power+1000 for each card in your hand.”. AUTO (RC): [CB1 & SB1] When this Unit’s attack hits a Vanguard, you can pay the cost. If you pay it, look at the top 2 cards of your Deck, add 1 of them to your hand, and place the other on the bottom of your Deck. CONT (RC) GB1 Oracle: During your turn, for every card in your hand, this Unit gains Power+1000. ACT (VC) 1/Turn: [CB1 & SB1 & Choose 1 face-down card in your G Zone with the same name as this card, flip it face-up] Draw 2 cards. ACT (VC) 1/Turn GB3 Oracle: [Choose 1 face-down card in your G Zone, flip it face-up] Ddring that turn, your opponent cannot Call G Guardians or, from their hand, Grade 0 cards to the (GC).